//PICTURED ABOVE: Hockaday lower, middle and upper schoolers sprint alongside their teachers, friends and families as paint flies through the air, bringing a colorful element to the athletic fields. The event allowed for the entire Hockaday community to come together in the pursuit of athletics and unity. The horn blares, and tiny cups fly into the air as streams of green and blue and pink paint the sky. Marshalls fill their paint bottles, poised to squirt unsuspecting runners as they pass by their stations. Laughter fills the air as hundreds of Lower, Middle and Upper School girls trample through the grass, marking the beginning of Hockaday’s first color run on March 27. 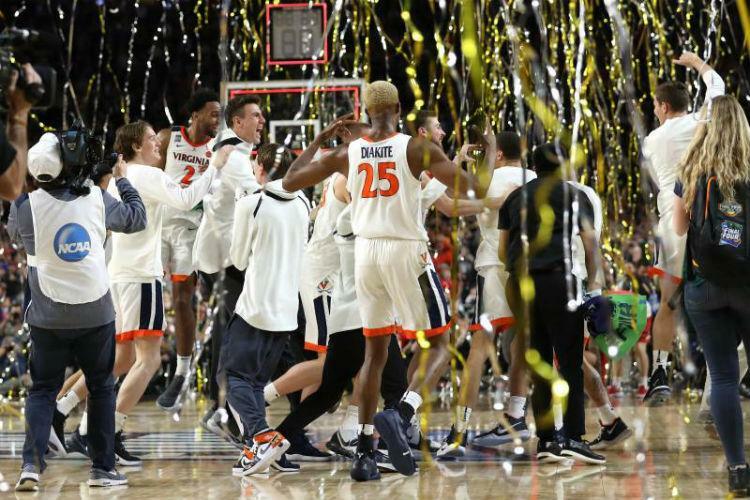 The run was the culmination of an athletic administration meeting back in the fall. Director of Athletics Deb Surgi met with Coordinator of Athletic Operations LaBoris Bean and other athletic directors to plan a school-wide event celebrating athletics. “The intent was to come up with a fun, community event that was also going to be a nice culmination for the cross country season where we could publicly honor our cross country seniors,” Surgi said. The directors brainstormed many ideas, including an obstacle course and a mud run, but ultimately settled on a color run, a manageable activity that would appeal to a large age group. However, the event, originally scheduled for the fall, was canceled due to bad weather. Sophomore cross country runner Emily Stevenson had planned to participate in the run with her team. “I was disappointed since a lot of people go to games for other sports, but cross country meets are at 7 a.m. on Saturday mornings in the middle of nowhere. Besides [the Southwest Preparatory Conference], people never come to the meets,” Stevenson said. According to Athletic Board Chair Meredith Jones, Surgi carefully rescheduled the run, specifically picking a day that wouldn’t conflict with sports games. This allowed all seven spring athletic teams to participate in the color run. Not only did Surgi have to manage rescheduling the run, but she also had to pay close attention to each detail in organizing the event. “How do you manage a color run? You have to get the nontoxic color, you have to buy the proper bottles to squirt color, you have to have people who are managing color run stations, decide on the optimal placement for color run stations,” Surgi said. In fact, Surgi estimates that there were 48 squirt bottles at each color station, totalling about 288 bottles total. Her long list of duties also included organizing the sound station and food trucks, which offered sliders and popsicles from Steel City Pops. Surgi and Bean both studied documents on how to manage a color run to help them plan every little detail. In addition, Surgi had to arrange a way to honor the cross country seniors, eventually deciding to give them flowers at the beginning of the race and to have them lead the runners. “Whenever you have a race, when people are running, or walking, and they’re tired, you don’t want them to think about direction. Everything needs to be clear,” said Surgi. This prompted her to add signs directing runners and a green fence that prevents people from crowding the finish line. Moreover, Surgi ordered branded split-H flags, green and white flags and a solid green mesh fence, so that as people drive by the school, they would see an abundance of Hockaday’s colors. 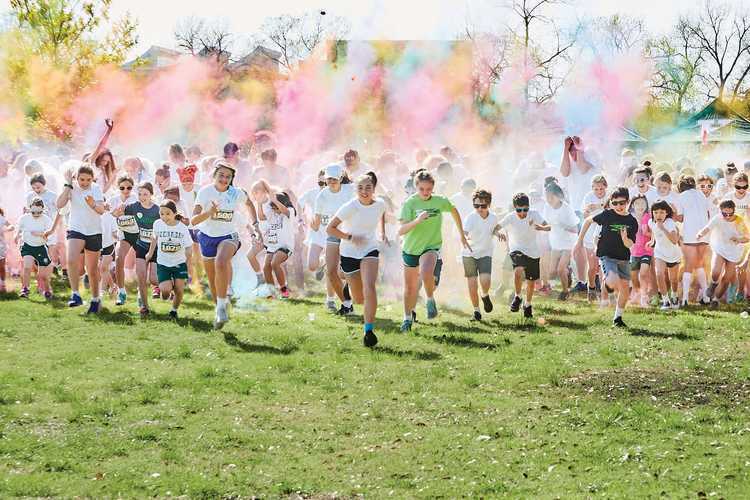 She also drew inspiration for the one-mile color run route from the Daisy Dash, a 5K hosted during Hockaday’s centennial year. Working with Creative Director Elizabeth Malakoff, Surgi drew up a detailed map of the route, with rainbows marking each of the color run stations. Another key factor was communicating with and placing the 24 marshalls, who were positioned at six color stations along the route to squirt runners as they passed by and to facilitate the event. They were given a detailed list of instructions that included covering both sides of the course, aiming below the shoulder, wearing their designated shirts and more. Although the athletic department did not post the finish times or list the order of finishers, they hope to add a time clock in the future so participants would be able to access that information if they are interested. Surgi expressed that she would like to get the whole Hockaday community involved in refining the color run. “We are already thinking about how we can improve the event and welcome feedback from the community,” Surgi said. In addition to the time clock, the athletic department hopes to have more food trucks, stations for registration, a DJ and more color. However, Surgi was not alone in managing every detail of the color run. Bean directed the race and set up the course, cross country coach and Upper School science teacher Jen Fore managed registration, Head Athletic Trainer Jeanne Olson kept everyone safe by preparing the wellness center and Malakoff designed flyers and communications for Daisy Mail. Surgi also appreciated the efforts of all the coaches who gave up practice to participate as well as the security and maintenance teams that worked the event. “I knew we were going to have fun when I witnessed Coach Stanfield and Coach Rowe spraying each other with color at their color stations prior to the race,” Surgi said. Furthermore, track managers Sophia Kim and Amanda Peppard were delegated minor duties, such as filling paint bottles. The Athletic Board, although not managing the run directly, participated in support of the run and gave their input on the event. “Anything that we need, we know we can go to the board and say, ‘We need help with this,’” Surgi remarked. The board also promoted the color run by posting updates and reminders on their Snapchat story, hoping to encourage students to run. Whether it be marketing, actual management or brainstorming, the athletics department looks to the board for all things leadership regarding athletics, according to Surgi. Jones noted that while there are many athletic teams in the spring, practices are often spread out, with crew practicing off campus and fencing practicing indoors. Stevenson looked forward to celebrating the cross country seniors, especially because it would be their last year. Surgi also noted that she was surprised when over 100 people showed up to register on the day of the run. Cross country coach and Upper School math teacher Rachel Grabow and Fore worked hard to register everyone in order to start the run on time. For Surgi, the greatest satisfaction comes from the people. According to her, she enjoys seeing everybody come out with their families, supporting one another and having a good time.